The perfect gift for the wanderer in your life! A beautiful, hand painted ornament. 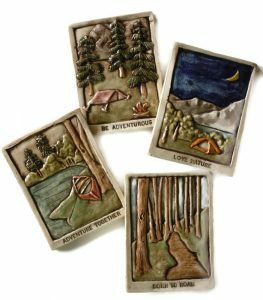 This 3 in x 4 in stoneware, ceramic tile is a unique gift or a special treat for yourself. Every tile is hand painted individually, so the ornament colors may vary slightly from the picture above…The beauty of a handcrafted gift! Ornament comes with a suede leather cord. Are you Born to Roam? Do you know someone who is? This ornament is just for you! A beautiful, hand painted 3 in x 4 in ornament crafted from stoneware clay for beauty and durability. This listing is for a the ornament, but you can get this piece as just a ceramic tile HERE. A unique way to add what you love to your tile installation. Each tile begins as a slab of clay, hand carved and cast in plaster. Take a moment to read our tile process HERE. This ornament is hand painted and may vary slightly in color from the photo. This ornament makes a great gift for someone who was Born to Roam or for the wanderer in you!